In the construction of commercial and passenger vehicles, laser projectors are used to position mounting elements such as brackets, braces, and electrical wiring. 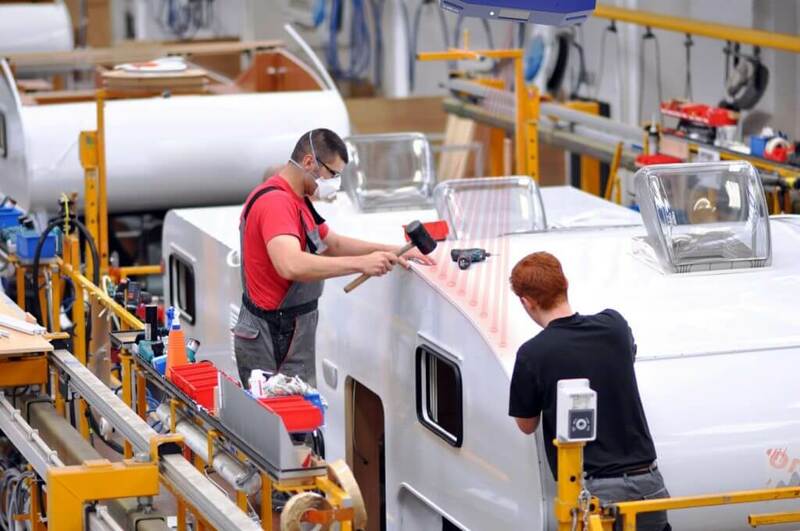 In the manufacturing of commercial and passenger vehicles, our Laser Projectors are used to position mounting elements such as brackets, braces, and electrical wiring. By projecting target positioning directly onto a vehicle’s surface, it’s possible to place and install components at a much higher speed. This makes rendering elaborate templates unnecessary. 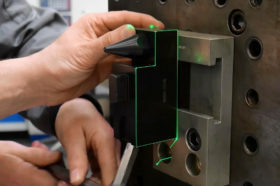 The complex task of achieving automatic control of assembly results (target-actual comparison) is also made doable with the use of our lasers for the automotive industry. 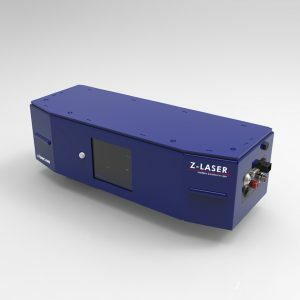 In special-purpose vehicle construction (heavy duty vehicles, locomotives, freight cars), the use of laser projectors enables a fast and precise display of the target position of attachments and components on the frame or floor of the vehicle. This provides assembly workers with intuitive instructions and positioning assistance both at once, completely eliminating the need for high production costs and the time-consuming handling of stencils. The production of special vehicles are often one-offs, which means the work process can at times be poorly automated. Even today, manual assembly still plays an important role in this industry. The steel frame inside a vehicle is a great example, as needs include brackets for hydraulics, welded parts on the vehicle floor, and wall elements. The marking of mounting positions is currently carried out with the use of heavy metal stencils, which are placed on the workpiece. Laser projectors are the modern alternative to stencils. They project the precise positioning of components directly onto your workpiece. External contours and explanatory text such as part numbers can also be shown. When preparing the drawing data, care is taken that parts are grouped according to the work steps and internally assigned to different pencil colours. 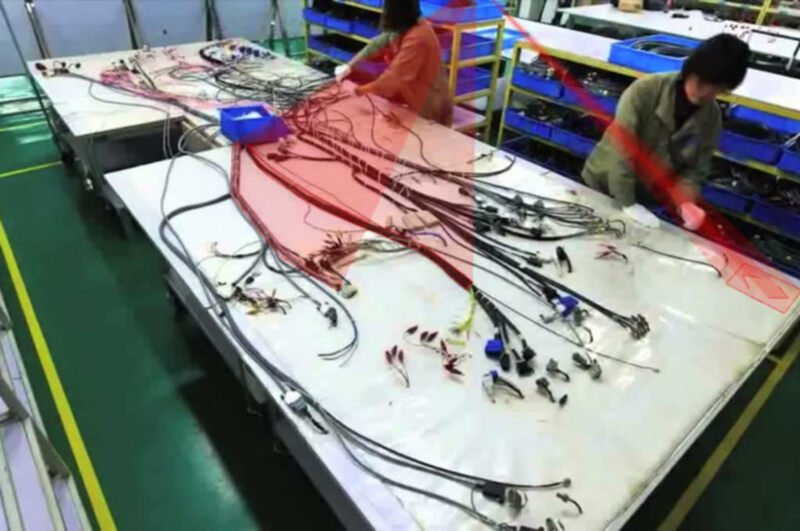 With the aid of a remote control, the operator can display the individual assembly groups one after the other and draw them out or install them directly. A 90% time reduction is achieved, compared to manual set-ups. Wall and floor elements are manufactured using the “sandwich” method in a caravan construction style. Laser projectors are used for positioning mounting elements such as fixtures, braces, and electrical wiring. To optimize your sequence of production steps, individual mounting elements can be assigned to separate graphics layers so they can be projected one after another. As a rule, 2 LP-HFD per work table are required. Laser projectors display the installation plans for cable harnesses. The clear illustration of laying paths of the strands as well as the correct plug-in positions for the sockets greatly reduces the time needed for small and medium-sized applications. Production staff can immediately begin producing cable harnesses and the the process of allocating cables, plugs, and plug-in positions unfolds much more quickly. Laser projection systems can display installation plans as well as the correct connection positions. They also guide staff visually and intuitively through the production process.